Discussion in 'Photos & Videos' started by OPSSG, Sep 1, 2010. On 31 Aug 2010, Deputy Prime Minister and Minister for Defence Teo Chee Hean visited the Singapore Armed Forces (SAF) task group deployed in the Gulf of Aden for international counter-piracy operations at sea (See Navy News for more details of Operation Blue Sapphire). He was accompanied by Chief of Navy Rear-Admiral Chew Men Leong and other senior SAF officers. 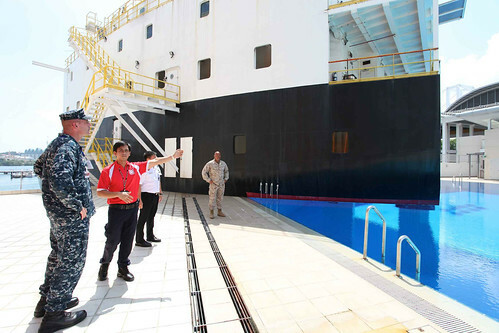 During the visit on board the Republic of Singapore Navy's Landing Ship Tank (LST) RSS Endurance, Mr Teo was briefed on the task group's operations and observed a drill by the task group when activated to respond to a pirate attack on a merchant vessel. Mr Teo also interacted with the men and women of the SAF task group, who shared with him their operational experiences during their two months of deployment. Speaking to the media after his visit, Mr Teo emphasised the important role that the SAF is playing as part of the multinational effort to safeguard shipping in the Gulf of Aden. Mr Teo said, "Our guys are out here contributing to an international mission, they are 3,000 miles away from home, it looks like it is far away but it actually has a direct relevance to our security in Singapore." 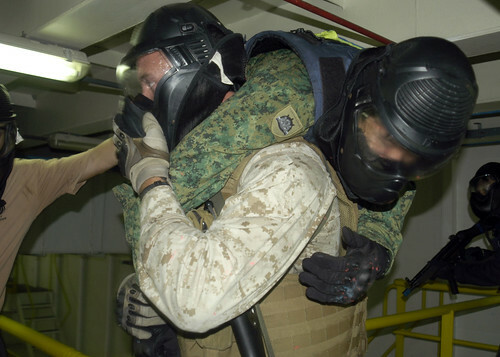 The 221-strong SAF task group, consisting of personnel from the Army, Navy and Air Force, was deployed in June this year, and operates under the ambit of Combined Task Force (CTF) 151, a multinational task force established in 2009 to conduct counter-piracy operations in the Gulf of Aden. Comprising an LST with two Super Puma helicopters on board, the SAF task group has been conducting daily helicopter surveillance flights and sector patrols to deter and disrupt piracy activities. The SAF first deployed a task group, consisting of LST RSS Persistence with two Super Puma helicopters on board, to the Gulf of Aden from April to July last year. The SAF was also in command of CTF 151 from January to April this year. Following this visit, Mr Teo will visit the Sultanate of Oman where he will call on His Highness Sayyid Fahd Bin Mahmoud Al-Said, Deputy Prime Minister for the Council of Ministers, His Excellency Sayyid Badr Bin Saud Al-Busaidi, Minister Responsible for Defence Affairs and other Omani Ministers. From 26 July 2010 to 3 August 2010, RSS Endeavour visited to Ambon, Indonesia for a socio-civic programme. About 200 RSN personnel joined the TNI AL and provided social assistance, primary health and dental care for 2,000 Ambon residents (and conducting more than 100 surgeries both on-shore and on-board the ship). As part of the programme, a RSN surgical team also treated patients on board the RSN's Landing Ship Tank RSS Endeavour and on shore. 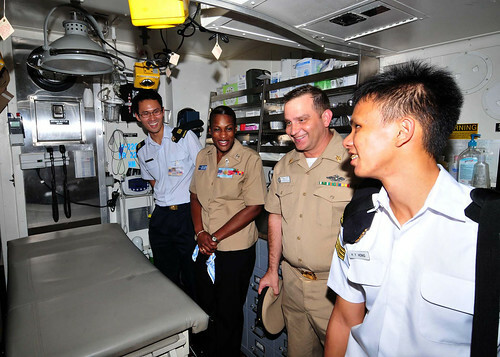 Indonesian Defence Minister Dr Purnomo Yusgiantoro being briefed by Major (Dr) (NS) Nelson Chua (left) and Chief Navy Medical Officer Colonel Kang Wee Lee (right) on how surgeries are performed on board RSS Endeavour. 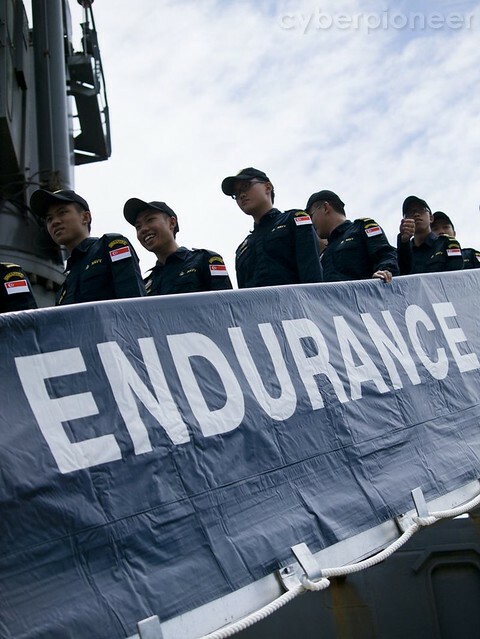 The Endurance Class are flexible ships that have been tasked to deliver aid after a Tsunami, hunt pirates and as well as serving as floating surgical theaters on missions - making Singapore, as a country, look like a contributing member of the UN and ASEAN. And M4a1 on as opposed to SAR21! looking forward to us Aussies getting their hands on their LHD in a few years time. Yes, Khai Yan is very popular with the guys. 18 September 2010 -- A helicopter from NATO warship USS KAUFFMAN located a suspicious skiff with five suspected pirates on board. USS KAUFFMAN is operating as part of NATO’s maritime counter-piracy task force in the Gulf of Aden. 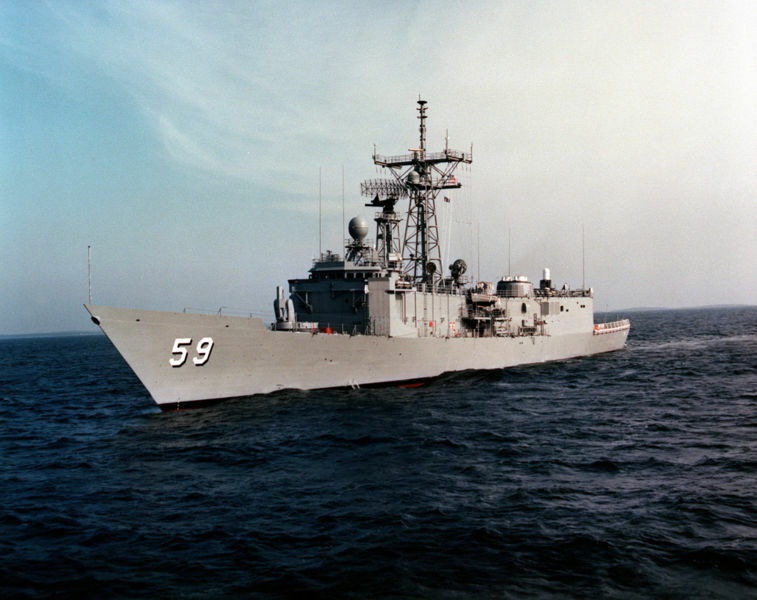 As USS KAUFFMAN closed to investigate the skiff, the nearby helicopter of coalition warship ENDURANCE from the Singapore Navy, operating with Combined Task Force 151, also closed to support. As both helicopters approached, the pirates threw a long ladder, which they use to scale innocent merchant ships, in to the sea, together with other pirate related items. As soon as she was close enough, USS KAUFFMAN sent her boarding team to search the skiff, and so ensure the suspected pirates could no longer pose a threat to shipping. "It is important for the RSAF and SAF to continue to support these missions so that Singapore can make a meaningful contribution to the counter-piracy efforts in the Gulf of Aden. There were also operational benefits for our crew to conduct such joint task group operations. The deterrence impact was immediately felt, and there was no attacks in the TG’s assigned sector during its tour of duty." "Operating at high sea state and low light illumination were some challenges that the detachment faced in theater which could not be replicated in our training back in Singapore. It was a great learning experience and it enriched me greatly, both professionally and personally." "The synergy between Services was good. Through the joint planning between pilot and our naval counterparts, we were able to streamline the operations. Given the challenging circumstances we operated in, the outstanding inter-Service working relations helped us overcome some of the challenges." 8 Oct 2010 -- RSS Endurance returns from counter-piracy patrol from the Gulf of Aden, following a three-and-a-half month stint there. Since the establishment of multinational naval operations to combat piracy in the Gulf of Aden in early 2009, the number of successful attacks in the area has declined. However, the piracy situation there continues to be a cause for concern. According to the UN, there had been 139 piracy related incidents off the coast of Somalia, with 30 ships hijacked, and 17 ships and 450 seafarers held for ransom in the first seven months of 2010. This is the 2nd SAF task group to be deployed to the region and the SAF task group operates under the ambit of Combined Task Force (CTF) 151, a multinational task force established in 2009 to conduct counter-piracy operations in the Gulf of Aden. As the sailors and airmen disembark from the RSS Endurance, they know that a third task group, comprising a landing ship tank with two Super Puma helicopters, will be deployed to the region in the second half of 2011. 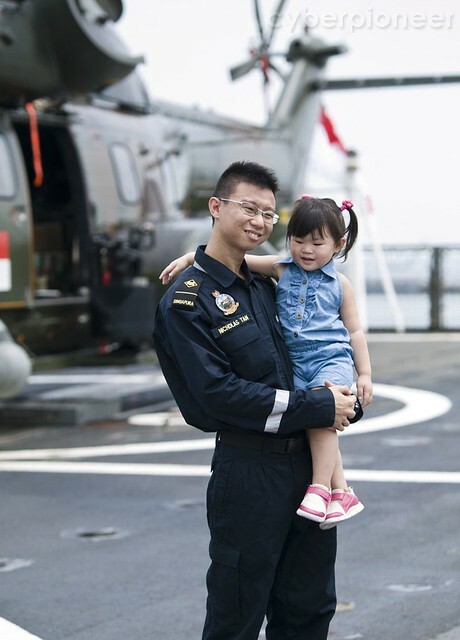 A RSN sailor holding his little girl before a Super Puma on the flight deck of RSS Endurance. Earlier, Mindef had announced it would deploy a Fokker-50 maritime patrol aircraft to the Gulf of Aden from December 2010 to February 2011. The men and women of the 2nd SAF task group happy to be back home in Singapore with the knowledge that Singapore remains committed to the counter piracy efforts the Gulf of Aden. 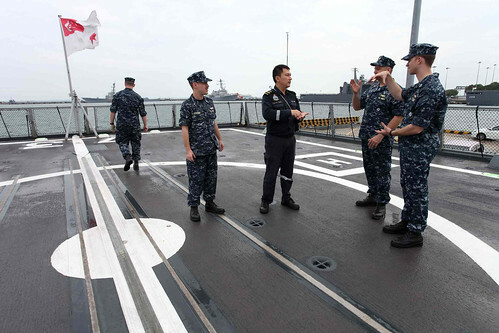 Below, U.S. Navy Rear Adm. Scott Sanders, left, salutes Rear Adm. Bernard Miranda of Singapore, right, Wednesday, Jan. 20, 2010, during a change-of-command ceremony aboard the USS Hopper docked in Manama, Bahrain, as U.S. Vice. Adm. William Gortney, centre, watches. Miranda of Singapore, who took over from Sanders the rotating command of a multinational task force charged with maritime security in the volatile region, said disrupting piracy off the coast of Somalia would remain the task force's main focus. Below, RADM Bernard Miranda (right) witnessing the change of command between incoming Commanding Officer CDR William R. Daly (left) and outgoing Commanding Officer CDR Philip E. Sobeck (centre). 21 Apr 2010 -- Flagship of Combined Task Force (CTF) 151, USS Farragut, conducted a change of command ceremony on 20th April, which saw the incoming commanding officer CDR William R. Daly taking over the helms from CDR Philip E. Sobeck. The short, but significant, ceremony was presided by RADM Bernard Miranda, Commander Combined Task Force 151 (CTF 151). The CTF 151 command team had been operating onboard the flagship USS Farragut since 25 Jan 10. Reflecting on the time spent onboard USS Farragut, RADM Miranda said, "CDR Philip, together with his officers and crew, had been most supportive and accommodating to the CTF 151 staff. I deeply appreciate his support, friendship and unwavering dedication. 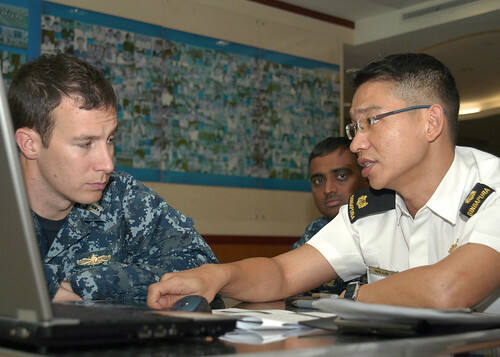 From January to April 2010, Rear Adm. Bernard Miranda, Republic of Singapore Navy, served as commander of CTF-151. 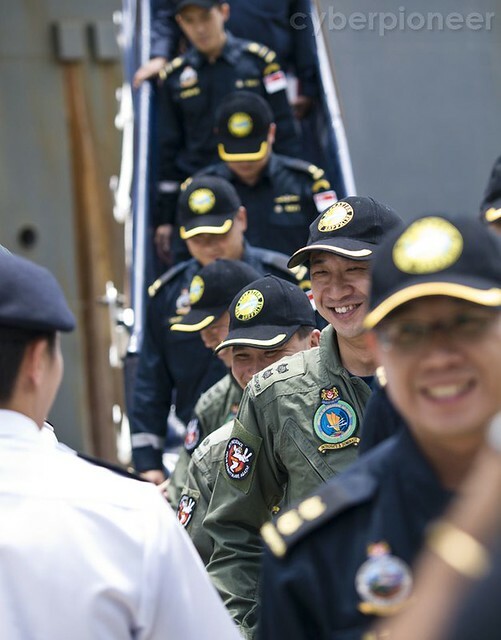 Beyond the deployment of a 3rd task group and a Fokker-50 maritime patrol aircraft, later this year and in the next year, the SAF had also accepted an invitation to command CTF 151 for the second time from Mar to Jun 2011. 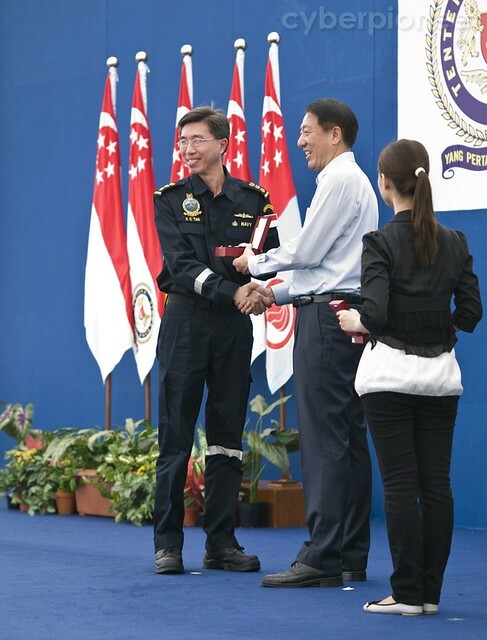 Deputy Prime Minister and Minister of Defence Teo Chee Hean presenting the Overseas Service Medal in recognition of the contributions of the men and women sent to participate in the international counter-piracy efforts in the Gulf of Aden (GoA). 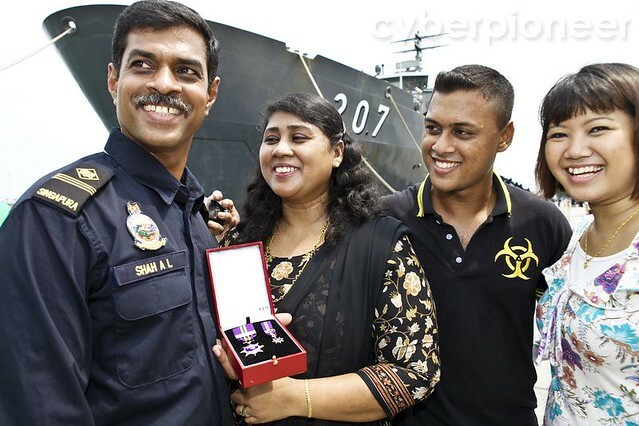 The recipients included 300 servicemen who were part of an SAF task group that had just returned from the GoA, and two officers who served as part of the CTF 151 command team, led by the Republic of Korea Navy (ROKN), from Apr to Sep this year. 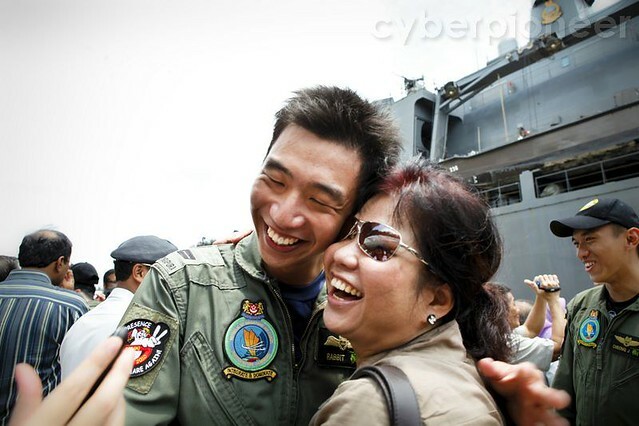 --> Below more picture taking with friends and family of members of the 2nd SAF task group that has just returned from the Gulf of Aden. [nomedia="http://www.youtube.com/watch?v=noLgjADodfM"]Size Matters - The Navy's Landing Ship Tanks (Defence Watch Nov 09) - YouTube[/nomedia]. Singapore Navy Launches Second Archer-Class Submarine, RSS Swordsman. 20 October 2010 - Minister for Education and Second Minister for Defence, Dr Ng Eng Hen, officiated at the launch ceremony of the Republic of Singapore Navy's (RSN) Archer-class submarine RSS Swordsman at the Kockums Shipyard in Karlskrona, Sweden, today. 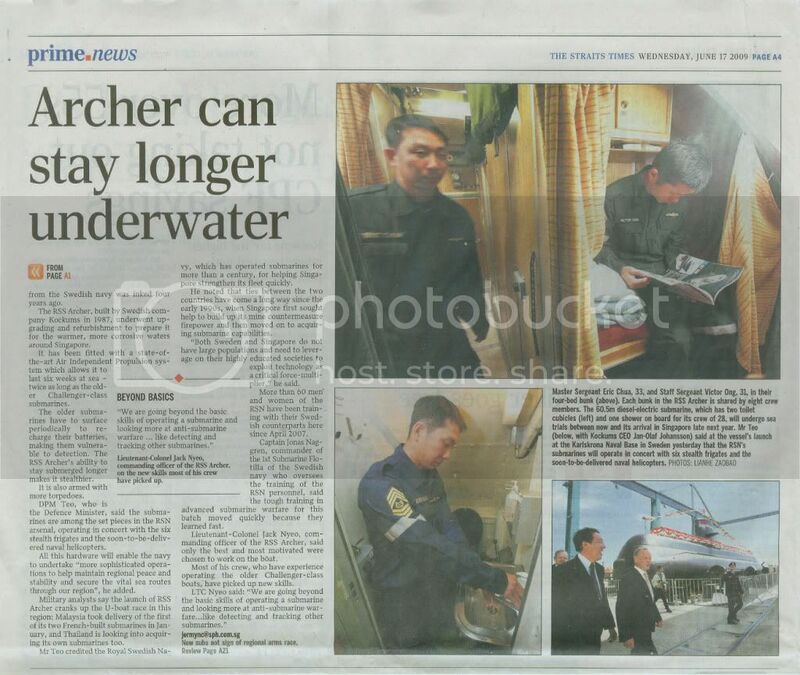 The submarine was launched by Mrs Ivy Ng, wife of Dr Ng. Below, Mrs Ng launching the RSS Swordsman together with (from left) Swedish Minister for Defence Sten Tolgfors, Kockums AB chief executive Ola Alfredsson, Dr Ng and Chief of Staff (Naval Staff) Rear-Admiral Tan Wee Beng. The launch of RSS Swordsman reflects the deep strong defence partnership cooperation and longstanding friendship between Singapore and Sweden. Both countries share a close defence relationship founded on many shared interests, which stretches back to the 1970s. Bilateral defence relations between Singapore and Sweden also extend to the realm of defence science and technology. Singapore's DSO National Laboratories and Defence Science and Technology Agency (DSTA) have good working relationships with the Swedish Defence Materiel Administration, the Swedish Defence Research Agency and Kockums. Note*: Mindef's released info on the class, can be found here. RSS Swordsman (ex-HMS Västergötland) is the sister ship of RSS Archer (ex-HMS Hälsingland), which is undergoing sea trials at the moment. Below a pix of RSN submariners hard at work training with their experienced Swedish counterparts in the cold and windy Baltic region. With the launch of the RSS Swordsman, the submarine crew has come away not only prepared for the challenges ahead, but also with a healthy respect for, as well as a strong rapport with, their Swedish counterparts. According to David Boey's blog, the Archer-class submarines follows the naming convention for the RSN's Challenger-Class submarines, which were also named after a class of 12 Swift-class Coastal Patrol Craft (CPC) launched in the 1980s. By way of background, Singapore's Ministry of Defence signed an agreement with Kockums for the supply of two Archer class (formerly Västergötland class) submarines to the Singapore Navy on 4 November 2005. More than 20 years old and previously in reserve with the RSwN. These two submarines have been rebuilt, life-extended and modernised. As part of the modernisation, the two submarines have also been lengthened by inserting a a 12 m hull plug which contains a Stirling air-independent propulsion (AIP) system (with two Stirling-cycle units in the API system). The Archer-Class are powered by hybrid diesel-electric propulsion units, with the Stirling AIP system supplementing the conventional diesel-electric system. In each Archer-Class submarine, there are two adjunct, Stirling-cycle propulsion units (with approximately 75 kilowatts of power each) that burn liquid oxygen and diesel fuel to generate electricity for either propulsion or charging batteries. According to Jane's each of two Archer-Class submarines received a Stirling Mk 3 AIP system, a pressurised diver's lock-out chamber in the sail, and a new climate control system. The combat and sensor systems have also been modernised, and France's DCNS is believed to have supplied weapon control and tactical data modules from its SUBTICS combat system. Other upgrades include new Thales flank array sonar equipment, new Kollmorgen periscopes and the integration of the WASS Black Shark heavyweight torpedo. AIP is only a tool and is only a function of the 'indiscretion rate' of the sub, given it's mission profile. Keep in mind that an AIP is a secondary or auxillary system. Therefore AIP does not replace the sub's generators or batteries and carries inherent limitations. Traditionally, the need to run the diesel engines to recharge the batteries has historically been an Achilles heel of diesel-electric submarines, as is the case in the Singapore Navy's older Challenger-Class submarines. When these submarines run their diesel engines, they need to raise a 'snorkel' (or ‘snorting’) to allow the intake of air and the expulsion of exhaust. When diesel-electric submarines are snorting, they are more vulnerable to detection from a variety of sources. In fact, any protrusion above the surface, be it a periscope, snorkel or antenna, can make the submarine more vulnerable to detection. The proportion of the time that a submarine has a snorkel above the water is called the ‘indiscretion rate’. Since diesel-electric submarines have to recharge their batteries at intervals, they have a certain indiscretion rate forced upon them. When compared to the Challenger-Class, the submerged endurance of the Archer-Class is increased from days to weeks. Therefore the Stirling AIP system installed increases the tactical flexibility of the Archer-Class submarines by reducing their indiscretion rate. For more information on types of AIP systems see Dr. Edward C. Whitman's 2001 article titled, 'AIR-INDEPENDENT PROPULSION: AIP Technology Creates a New Undersea Threat'. It is the AIP system that gives the Archer-Class improved submerged endurance as compared to the Challenger-Class (which are NOT AIP equipped). This means the Archer-Class submarines need a climate control system and air renewal system to ensure high overall performance of the submarine and its crew. A distributed climate control system with optimized ventilation rates that gives low hotel load, decreased noise, and smaller installed volume was installed. This systems also allows the crew to set different temperatures for individual compartments. Unique onboard measurements are designed to yield excellent air quality during extended submerged operation. On 13 April 2009, Kockums and Singapore-based shipbuilder ST Marine signed a memorandum of understanding to form a joint venture company to provide technical and maintenance support for Singapore Navy's submarine flotilla. The Singapore navy currently operates 4 Challenger-Class submarines (ex-Sjöbjörnen Class), which were also acquired from the RSwN and shown in the above picture. The names of the 4 Challenger-Class submarines are as follows: RSS Challenger, RSS Conqueror, RSS Centurion and RSS Chieftain. Open source information have suggested that even the older Challenger-Class submarines are amongst the most sophisticated in South East Asia. This is because these submarines are using an export version of Australian localised signature management suite developed for the Collins-Class and also fitted with some Israeli sensors. Some of the technology exported for the Challenger-Class had previously only been put on nuclear powered submarines and Singapore is the second conventional owner to get the export version of the technology. Note*: General Characteristics cited in wiki are different from Mindef's released info on the class. (From left) CPT Yeo and LTC Song were part of the F-50 MPA detachment, while RADM Chan and ME4 Dhillon were part of the CTF 151 Command team. 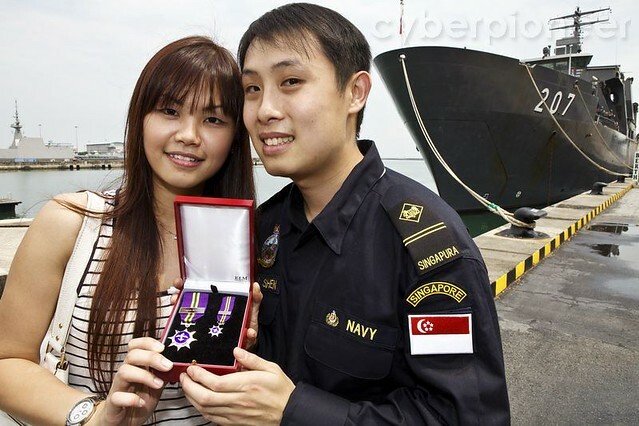 Master Sergeant Edmund Louis Nathan, an air crew specialist on board the F-50 MPA, also received the Overseas Service Medal. MAJ Ian Lin, who was responsible for planning and allocating patrol sectors for the warships in the International Recognised Transit Corridor (IRTC), had this to share, “In the early morning, all the units [in CTF 151] will highlight their constraints for the next few days. I will then try to de-conflict these requests. 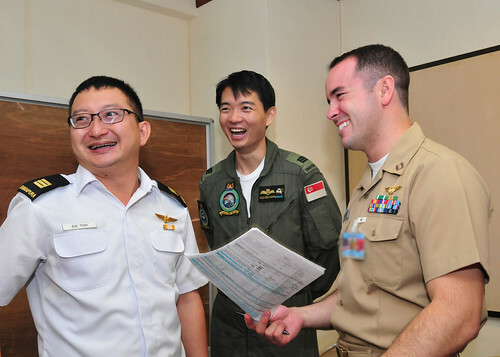 It is a recurring process, and it can be a little challenging, especially when dealing with many different nations and cultures.” Commander CTF-151, Rear-Admiral (RADM) Harris Chan also visited some of the warships operating in the theatre – the Chinese warship PLAN WENZHOU, the Japanese warship JDS SAZANAMI and the Indonesian warship KRI ABDUL HALIM PERDANA-KUSUMA, all of which deployed under their own national taskings. Led by Rear-Admiral (RADM) Harris Chan, Singaporean and international naval officers working together as part of the CTF 151 command team, in an operations brief on USS Mason. 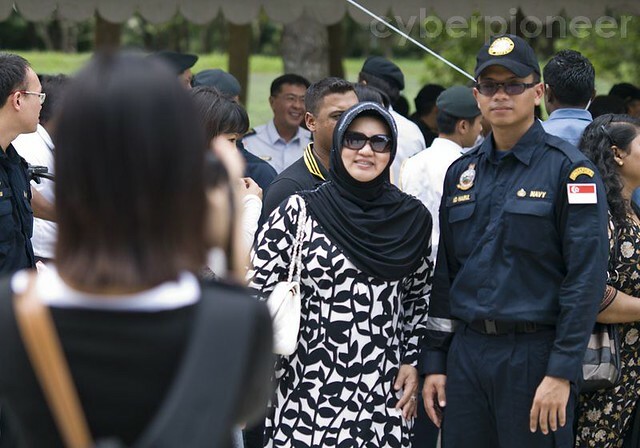 Mayor Laut (P) Dickry Rizanny N from the Indonesian Navy and Major (L) Mohammad Bahrin bin Md Yusof from the Royal Brunei Navy were two of seven International Officers (IOs) working with the SAF Command Team. Q: What is your role in CTF 151? Mayor Dickry: I worked within the Plans and Intelligence cells. I was responsible for force readiness in the Plans cell and I was an analyst compiling a Daily Press Summary (from open sources). Major Bahrin: I am worked in the Plans cell as a Future Operations Officer. Q: What do you do on a typical day? Mayor Dickry: I actively interacted with the teams in the cells I work in. I was happy to work with the RSN and the other IOs, especially in the operation to combat piracy in Somalia – the biggest problem now for naval forces and shipping in the Gulf of Aden. Major Bahrin: In a multi-national environment, I was fortunate to have experienced many different cultures and ways of life. Personally, I had a great time while staying on board and I was able to work with people from a myriad of cultural backgrounds. The food was good, which added to the experience. 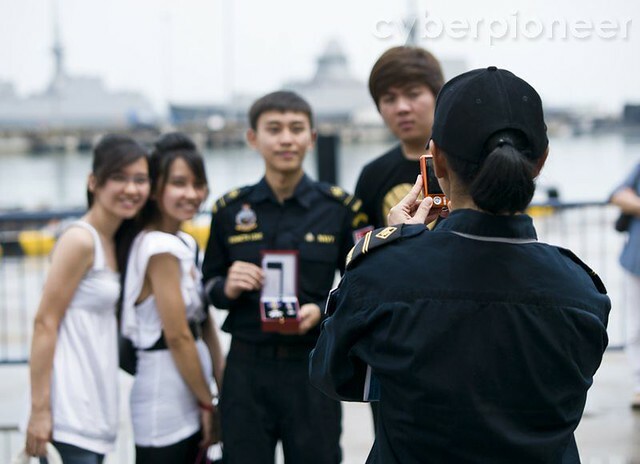 Q: What have you learnt in your time with CTF 151? Mayor Dickry: It was my first time working under CTF 151, so I had many new things to learn, especially on board the command ship [USS MASON]. For example, how to manage units, allocate sectors to them, and coordinate and communicate with others. Those were important skills for me. This deployment was, indeed, valuable and precious for me. Major Bahrin: Actually I gained a lot of experience... especially since that was my first time working in a real operation and in theatre! What I could see was that many factors needed to be considered when making decisions at that level, and that can be only achieved by understanding the perspectives of different people and institutions at all levels of command. RADM Ng presenting the Singapore flag to the commander of the SAF task group, SLTC Richard Lim. Typically, the 229-strong SAF task group on RSS Endeavour (a Endurance class vessel) will spend about 68 days on patrol and generate about 80 sorties in that time frame in one counter piracy deployment. The two Super Pumas provide a proven capability to disrupt pirate attacks and will generate about 1.18 sorties per day in their sector patrols. The Super Pumas are important to the counter-piracy efforts due to their speed of response and on 18 Sep 2010 a Super Puma deployed from the RSS Endurance was able to scramble and provide timely assistance to USS Kauffman in stopping a pirate attack. 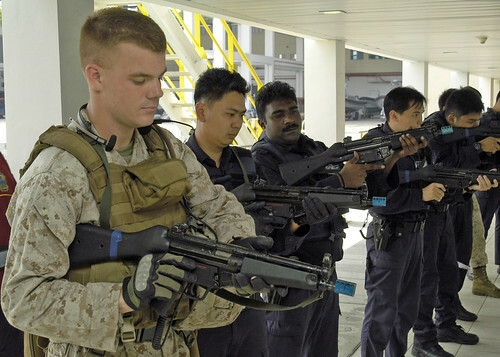 The Singapore Armed Forces (SAF) and the United States Navy (USN) are participating in the 17th Singapore-US Cooperation Afloat Readiness and Training (CARAT) exercise from 15 to 29 August 2011. This year, the SAF is participating with four ships, a submarine and 16 aircraft. The USN is participating with three ships, two naval helicopters and two maritime patrol aircraft. 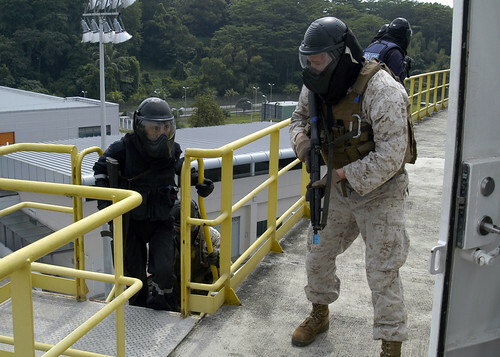 A total of 1400 personnel from both countries are involved in this year's exercise. USN Commander Patrol and Reconnaissance Force 5th/7th Fleet Rear-Admiral Sean Buck speaking at the opening ceremony of Exercise CARAT on 15 August 2011, along with RSN Fleet Commander Rear-Admiral Lai Chung Han. The RSN upgraded missile corvette RSS Valiant firing the Barak anti-missile missile against an air drone target simulating a missile attack on the ship. [nomedia="http://www.youtube.com/watch?v=TIoAX2hnndE&feature=player_profilepage#t=23s"]MINDEF News RSN Conducts Successful Missile Firing 23 Aug 11 - YouTube[/nomedia]. (L-R) Chief of Defence Force Lieutenant-General Neo Kian Hong, Senior Parliamentary Secretary for Defence and National Development Dr Mohamad Maliki Bin Osman, Minister of State for Defence and Education Lawrence Wong and Chief of Navy Rear Admiral Ng Chee Peng observing the successful live-firing. Swedish video on the launch of RSS Archer. The sister ship of RSS Swordsman, RSS Archer, which was launched on 16 Jun 2009, is expected to return to Singapore at the end of 2010. Sonar operators act as the eyes and ears of the submarine in detecting and classifying contacts. LTC Jack Nyeo, RSS Archer's commanding officer, checking the situation on the surface with the periscope while training in a Swedish submarine. With nine torpedo tubes compared with four in the Challenger-class submarine, the Archer-class boats are better equipped to defend Singapore. Torpedo Specialist SSG Victor Ong loading a torpedo into one of the torpedo tubes. For more info, read the cyberpioneer story on the Archer Class. 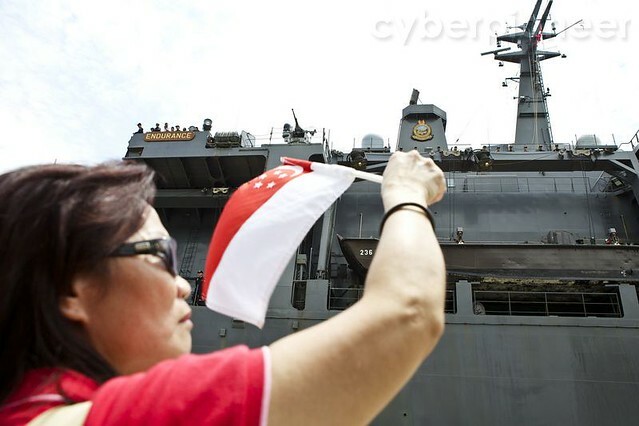 RSS Endurance (207):- commissioned 18 March 2000, is the first Singapore navy ship to circumnavigate the globe and participated in the 6th US Navy International Naval Review in New York City. 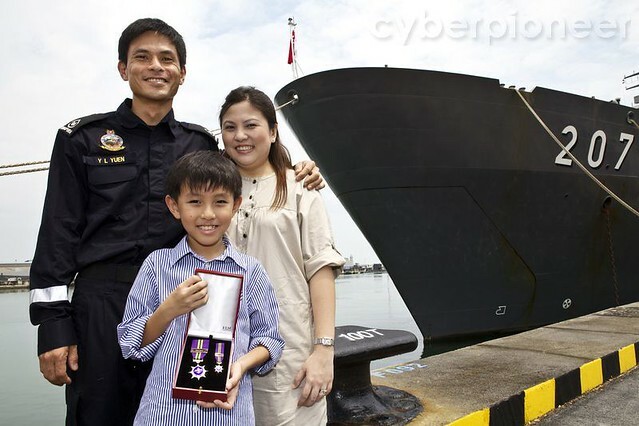 She is a lead ship of a class of four, for the Singapore Navy, that has a little story to tell. In October 2003, RSS Endurance deployed to the Northern Arabian Gulf under Operation Blue Orchid (in support of coalition efforts in Iraq). 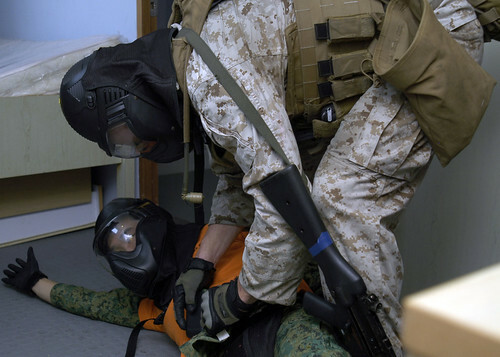 From 2003-2008, the Singapore Navy dispatched a total of five task groups to that area of operations to conduct a range of activities from oil platform protection at the sharp end, to training the Iraqi Navy and rendering medical aid to local communities (see link). A total of 998 SAF personnel served in these operations in support of the rebuilding of Iraq. On 6 January 2005, RSS Persistence, her sister-ship arrived with more aid supplies. And on the 16 January 2005, RSS Endeavour arrived carrying more supplies and NGO aid workers. At its peak, over 1,500 SAF personnel were deployed in Operation Flying Eagle. With RSS Resolution deployed in the Northern Arabian Gulf in support of coalition efforts in Iraq, at that moment, all four of Singapore's Endurance class vessels were deployed on active operations overseas. On 12 February 2009, the then Minister of Defence Teo Chee Hean announced that RSS Persistence would join other naval forces off the coast of Somalia for three months in 2009. And thereafter, from June to October 2010, RSS Endurance deployed under command of the Combined Task Force 151 to protect shipping in the Gulf of Aden under Operation Blue Sapphire (see link). In the period that CTF 151 has stood-up, the Singapore navy's Rear Admiral Bernard Miranda and Rear Admiral Harris Chan have taken command of the task group at various times. On 30th June 2011, RADM Chan handed over command of CTF 151 to the Royal New Zealand Navy's Captain (CAPT) Jim Gilmour. Beyond previously deploying martitime patrol aircraft to the region, on 22 August 2011, the Singapore Navy deployed a third task group (RSS Endevour) in support of CTF 151. The RSS Formidable (68) is the lead ship of a class of 6 and are multi-mission derivatives of the French Navy’s La Fayette class frigate. The S-70B Seahawk naval helicopter is organic to the Formidable class. Above is the Singapore Navy's latest TV ad, which showcases a spectrum of capabilities and the people who form the backbone of Singapore's Navy. Beyond defending Singapore's maritime security, our Navy contributes actively to the international community, in humanitarian disaster assistance relief operations as well as international counter-piracy operations. 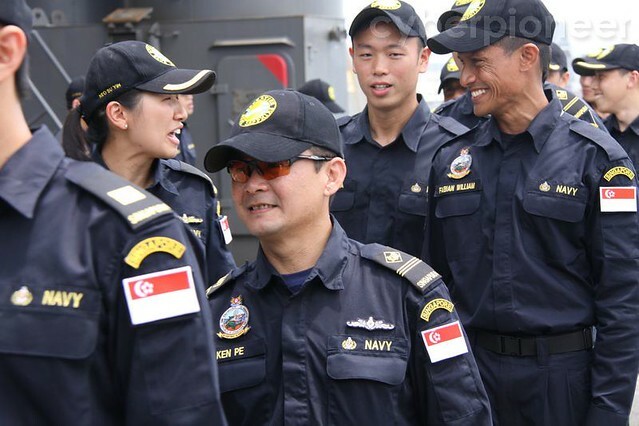 17 Oct 2011 - The Republic of Singapore Navy (RSN) was first invited by the Indonesian Navy (TNI AL) to join the Surya Bhaskara Jaya (SBJ), humanitarian assistance programme in 1997. From 11 Oct to 17 Oct 2011 in Pulau Belitung, Indonesia, the TNI AL and RSN took part in SBJ. About 200 RSN personnel joined the TNI AL to provide social assistance, primary health and dental care to the residents of the island. Members of the RSN's surgical team performing a surgery on a Pulau Belitung resident on board RSS Endurance. As part of the programme, surgeries were performed on board the RSN's RSS Endurance and the TNI AL's hospital ship, KRI Suharso. RSS Endeavour from the Republic of Singapore Navy (RSN) and two embarked Super Puma helicopters from the Republic of Singapore Air Force (RSAF), disrupted two separate attacks by suspected pirates on merchant vessels that were transiting through the Arabian Sea, south of Oman, on 1 Nov 2011. After the pirates have boarded the mothership dhow, the abandoned skiff is destroyed to prevent its use in further piracy-related activities. RSS Endeavour was patrolling east of the Internationally Recognised Transit Corridor (IRTC) in the Arabian Sea, when it responded to a call which the CTF 151 flagship USS Anzio had received from merchant vessel MV BW Broker, that it was being chased by a suspicious skiff... Less than two hours later, RSS Endeavour was contacted by another merchant ship, MV Elka Athina, in the vicinity. The vessel was being approached at high speed by a skiff with five people carrying weapons. RSS Endeavour launched a helicopter again to investigate. To congratulate the 229 men and women of the SAF Task Group serving aboard RSS Endeavour for a job well done, please go to www.seaofsupport.sg and post a message there for them. Below, servicemen from the SAF task group showing Mr Lawrence Wong and Rear Admiral Ng Chee Peng (Chief of Navy) how they remotely operate an Unmanned Aerial Vehicle from the bridge of RSS Endeavour to conduct surveillance. "Your actions will ultimately contribute to the safety, security and sovereignty of Singapore, and that's a high calling and a meaningful task... Be assured that all of us in Singapore recognise your efforts and contributions, and we'll continue to cheer you on and be proud of all that you do in the SAF." "I took my first steps on Pedra Branca yesterday, as part of a visit and update on the operational capabilities of our Navy. This island of Singapore, about 140m long and situated about 24 nautical miles away, commands the eastern-most approach to the Straits of Singapore. How many before me have spent many lonely nights here to ensure the safety of others? This tradition still carries on and even today, Singaporeans do their duty on the island faithfully. But of course, we have updated the technology on Pedra Banca to better monitor the heavy maritime traffic that passes through our channels - nearly 1,000 ships everyday!"